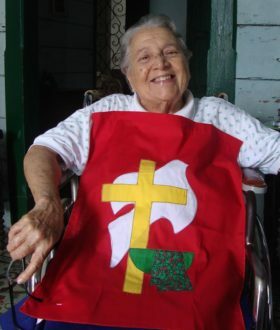 Juana Garcia, a pioneer leader of the Brethren in Christ Church in Cuba, passed away on January 20, 2017 at age 93. Garcia worked alongside Howard and Pearl Wolgemuth, who served as Brethren in Christ missionaries in Cuba in the 1950s. She lived with the Wolgemuths, and remained in that house until recently. In 1960, when the Wolgemuths were advised to leave because of the changing political situation and the rise of Fidel Castro’s regime, Garcia and Eduardo Llanes took over the responsibilities of the church, and after Eduardo also left Cuba for the United States, she led the church by herself. After she retired, she was injured in a car accident and spent her remaining years in a wheelchair. Her faith remained strong, and she wrote to the Wolgemuths’ daughter Judy Hamilton of praying for the church here. In her letters she would always write the verse, Philippians 4:13: “I can do all this through him who gives me strength” (NIV). The Historical Society sends our prayers and sympathy to the Brethren in Christ Church in Cuba, along with our thanks for Garcia’s many years of service to God and the church. So many of us remembering Juana Garcia with appreciation and with gratitude for God’s presence throughout her life.